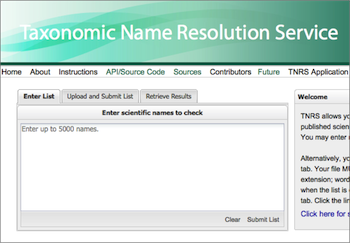 The Taxonomic Name Resolution Service (TNRS) is a tool for automated standardization of plant scientific names. The TNRS corrects spelling errors and alternative spellings to a standard list of names, and converts out of date names (synonyms) to the current accepted name. The TNRS can process many names at once, saving hours of tedious and error-prone manual name correction. For names that cannot be resolved automatically, the TNRS present a list of possibilities and provides tools for researching and selecting the preferred name. The TNRS was developed by BIEN in collaboration with The iPlant Collaborative, The Missouri Botanical Garden and many other individuals and institutions. Boyle, B, Hopkins, N, Lu, Z, Raygoza Garay, JA, Mozzherin, D, Rees, T, Matasci, N, Narro, ML, Piel, WH, Mckay, SJ, Lowry, S, Freeland, C, Peet, RK, Enquist, BJ. 2013. The taxonomic name resolution service: an online tool for automated standardization of plant names. BMC Bioinformatics 2013, 14:16, doi:10.1186/1471-2105-14-16.